Editors' preface: Who has rights to the land between the Mediterranean Sea and the Jordan River? Zionists cite biblical passages in which God awarded them Eretz Yisrael, the Land of Israel, in perpetuity in his covenant with the children of Israel. Muslims make a counter-claim based in part on verses of the Qur'an that describe the Jews in terms of contempt and in part on rulings in Muslim law that reject Muslims relinquishing rule over a territory under Muslim rule to nonbelievers. But other Muslims cite different Qur'anic verses in support of the Jewish claim. The conflict has a religious quality that makes it the more difficult to resolve. The Middle East Quarterly commissioned two essays presenting different views of the Qur'an and its passages dealing with the Holy Land and Jews. The first author, Robert Spencer, argues that Islamic law has not recognized and will never recognize Jewish rights to this territory. In a second essay, Muhammad Al-Hussaini, a Muslim scholar, understands the text of the Qur'an to award the Holy Land to the Jews for all time, and he holds that Muslims can be convinced of this interpretation. 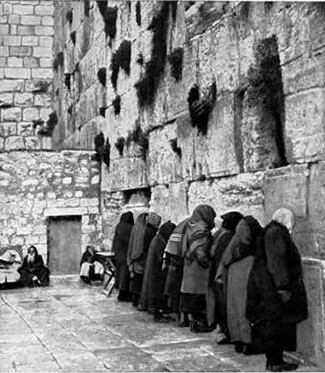 The Kotel, popularly known as the Wailing Wall, here circa 1927, is a wall that once stood outside Herod's Temple. Jews are not allowed to pray on the Temple Mount itself. Jerusalem is not once mentioned by name in the Qur'an or in Muslim prayers. The status of Israel has become a pivotal issue in all talks about the Middle East. Israel's legitimacy rests, not just on United Nations resolutions or Zionist aspirations, but, for many, on Biblical narratives and the historical connections of Jews with the Holy Land. A minority of Muslims find justification for the Zionist enterprise equally in the Bible and the Qur'an and believe that the Qur'an offers divine sanction for the establishment of a Jewish state in southern Syria. However, the majority cite other Qur'anic verses and passages from the Hadith (purported records of the Prophet Muhammad's actions and sayings), stating the exact opposite. This second, negative attitude toward Jews is expressed in sacred texts and in the body of Shari'a (Islamic law) where Jews, like all non-Muslims, are assigned a status that does not permit their becoming rulers over Muslims or over Muslim territory. Traditionally, this has not been an issue. Under the different Muslim empires, Jews were kept firmly in their place and represented no sort of threat to the ruling order. It is only in the modern period that this has become a burning issue. Thus, the transition from the Ottoman Empire to the British Mandate to modern Israel has been as much a religious as a political clash. The Arab onslaught of 1948 was religiously motivated, as is modern opposition to Israel by Islamist groups. The Hamas charter asserts that "the Islamic Resistance Movement [i.e. Hamas] regards Palestine as an Islamic Waqf consecrated for future generations until Judgment Day." A waqf is a religious endowment bestowed by God. Consequently, "neither it, nor any part of it, should be squandered: Neither it, nor any part of it, should be given up. Neither a single Arab country nor all Arab countries, neither any king or president, nor all the kings and presidents, neither any organization nor all of them, be they Palestinian or Arab, possess the right to do that. Palestine is an Islamic Waqf land consecrated for Muslim generations until Judgment Day." The charter is not unique: It represents a mainstream view among Muslims today. In contrast, several Muslim spokesmen have recently claimed that the Qur'an promises Israel to the Jews and that the claims of Hamas, Hezbollah, and allied groups are illegitimate on Islamic grounds. This is a comforting message, which some of these spokesmen have taken to Jewish audiences, reinforcing the idea that the Islamic jihad imperative against Israel is simply the province of a tiny minority of extremists and that the voices of reason, moderation, and Qur'anic authenticity will eventually prevail. Among these scholars is British-based imam Sheikh Muhammad Al-Hussaini, who asserts that early Muslim intellectuals recognized that Israel belonged to the Jews. "You will find very clearly that the traditional commentators from the eighth and ninth century onwards have uniformly interpreted the Koran to say explicitly that Eretz Yisrael [Heb. The Land of Israel] has been given by God to the Jewish people as a perpetual convenant [sic]. There is no Islamic counterclaim to the Land anywhere in the traditional corpus of commentary." Although an extremely comforting message to supporters of Israel, it is not true and is based on a partial and inaccurate reading of the Qur'an. Hussaini bases his argument primarily upon Qur'an 5:21 in which Moses declares: "O my people, enter the Holy Land which God has prescribed for you, and turn not back in your traces, to turn about losers." He then cites the classic Qur'an commentator Muhammad ibn Jarir at-Tabari (838-923), who explains that this statement is "a narrative from God … concerning the saying of Moses … to his community from among the children of Israel and his order to them according to the order of God to him, ordering them to enter the holy land." Tabari is not unique in this. Another respected Muslim exegete, Ibn Kathir (1301-73), says about Qur'an 5:21 that the Jews "were the best among the people of their time. ... God states next that Moses encouraged the children of Israel to perform jihad and enter Jerusalem, which was under their control during the time of their father Jacob. Jacob and his children later moved with his household to Egypt during the time of Prophet Joseph. His offspring remained in Egypt until their exodus with Moses. They found a mighty, strong people in Jerusalem who had previously taken it over. Moses, God's Messenger, ordered the children of Israel to enter Jerusalem and fight their enemy, and he promised them victory and triumph over the mighty people if they did so." But that is not the end of the story. Ibn Kathir then says that the Jews "declined, rebelled, and defied his order and were punished for forty years by being lost, wandering in the land, uncertain of where they should go. This was their punishment for defying God's command." In contrast, "The Muslim Ummah [community] is more respected and honored before God, and has a more perfect legislative code and system of life, it has the most honorable Prophet, the larger kingdom, more provisions, wealth and children, a larger domain and more lasting glory than the children of Israel." The idea that the "glory" of the children of Israel was not lasting explains why Hussaini's exegesis is incomplete. He quotes Tabari, saying that God wanted the children of Israel to enter the Holy Land but stops short at the rest of what the Qur'an says about them. But he argues that this promise is lasting, basing his comments on the nature of the Qur'an itself as understood in traditional Islamic theology: "It was never the case during the early period of Islam … that there was any kind of sacerdotal attachment to Jerusalem as a territorial claim. Jerusalem is holy but Mount Sinai is more holy. Sinai is mentioned far more often, and Jerusalem isn't actually mentioned [in the Qur'an] by name." Abasement and poverty were imposed and laid down upon them, as when someone says "the imam imposed the poll tax (jizya) … on non-Muslim subjects," or "The man imposed land tax on his slave," meaning thereby that he obliged him [to pay] it … God commanded His believing servants not to give them [i.e., non-Muslims] security—as long as they continued to disbelieve in Him and his Messenger—unless they pay the poll tax to them. [The] Qur'an describes the Jews with their own particular degenerate characteristics, i.e. killing the prophets of Allah, corrupting His words by putting them in the wrong places, consuming the people's wealth frivolously, refusing to distance themselves from the evil they do, and other ugly characteristics caused by their deep-rooted lasciviousness … only a minority of the Jews keep their word. … [A]ll Jews are not the same. The good ones become Muslims, the bad ones do not. So for their breaking their compact we cursed them and made their hearts hard, they perverted words from their meanings; and they have forgotten a portion of that they were reminded of; and thou wilt never cease to light upon some act of treachery on their part, except a few of them. Yet pardon them, and forgive; surely God loves the good-doers. Being thus accursed, the Jews are not the legitimate heirs of the promise made in Qur'an 5:21. The true heirs are those who have remained faithful to God (i.e., the Muslims), not those whom he has cursed (i.e., the Jews). Even this is not the full extent of Qur'anic anti-Semitism. The Muslim holy book contains many passages that form the foundation for hatred of Jews that exists independently of the actions of contemporary Jews or the State of Israel. The Qur'an portrays the Jews as the craftiest, most persistent, and most implacable enemies of the Muslims. The Qur'an is supplemented by the Hadith, purported records of the Prophet Muhammad's actions and sayings. Some hadith predict that at the end of the world, in the words of Ibn Kathir, "the Jews will support the Dajjal (false messiah), and the Muslims, along with 'Isa [Jesus], son of Mary, will kill the Jews." The idea that the end times will be marked by Muslims killing Jews comes from Muhammad himself, who said, according to a hadith, "The Hour will not be established until you fight with the Jews, and the stone behind which a Jew will be hiding will say: 'O Muslim! There is a Jew hiding behind me, so kill him.'" The Hour [resurrection] will not take place until the Muslims fight the Jews and the Muslims kill them, and the rock and the tree will say: "Oh, Muslim, servant of God, there is a Jew behind me, kill him! A vivid illustration of the Qur'an's enmity toward the Jews and how contemporary Islamic spokesmen echo it, came in 2004 from Islam Online, a website founded by the internationally influential Sheikh Yusuf al-Qaradawi. Although Qaradawi has won praise from Islamic studies professor John Esposito for engaging in a "reformist interpretation of Islam and its relationship to democracy, pluralism, and human rights," that reformist impulse does not carry over to Qaradawi's view of Jews (he has justified suicide bombings against Israeli civilians), or the anti-Semitism he has allowed to be published on Islam Online. In 2004, the site posted an article entitled, "Jews as Depicted in the Qur'an," in which Sheikh 'Atiyah Saqr, former head of the Fatwa Committee at Al-Azhar University and Seminary in Cairo, depicts Jews in a chillingly negative light, illustrated with quotations from the Qur'an. Among other charges he levels at the Jews, Saqr says that they "used to fabricate things and falsely ascribe them to God"; they "love to listen to lies"; they disobey God and ignore his commands; they wish "evil for people" and try to "mislead them"; and they "feel pain to see others in happiness and are gleeful when others are afflicted with a calamity." Though he offers many examples of the alleged evil traits of the Jews supported by the Qur'an, Saqr does not mention the notorious Qur'anic passages that depict an angry God transforming Jews into apes and pigs. The first of these depicts God telling the Jews who "transgressed the Sabbath … Be you apes, miserably slinking!" It goes on to say that these accursed ones serve "as a punishment exemplary for all the former times and for the latter." The implication is that today's Jews are bestial in character and are the enemies of God, just as the Sabbath-breakers were. Tantawi has called Jews "the enemies of Allah, descendants of apes and pigs." Saudi sheikh Abd al-Rahman al-Sudayyis, imam of the principal mosque in the holiest city in Islam, the Masjid al-Haram in Mecca, has said in a sermon that Jews are "the scum of the human race, the rats of the world, the violators of pacts and agreements, the murderers of the prophets, and the offspring of apes and pigs." Yet Hussaini actually asserts that the Muslims who oppose his perspective have no Qur'anic case, asserting that "no fundamentalist, no matter how hard they try, can overrule the existing tradition to say there is, in fact, an Islamic counterclaim to Eretz Yisrael." The Qur'anic evidence above explains why mainstream Muslim voices and prominent Muslim leaders never invoke Qur'an 5:21 to argue that Muslims ought not to be waging jihad against Israel. This is simply not a mainstream view or one that most of those who are familiar with the totality of the Qur'an would ever advance. It gives Jews and all supporters of Israel hope, yes, but only a false hope. Muslims can get beyond anti-Semitism and anti-Zionism only by forthrightly acknowledging that the Qur'an and Sunna do, indeed, teach that the Jews are accursed and are to be warred against. Muslims must explicitly formulate theological frameworks that reject literalism in this regard. To deny that the Qur'anic evidence actually says what it does, however, is only to allow the endemic and pandemic problem of Islamic anti-Semitism to continue unchallenged. Robert Spencer is the director of Jihad Watch, a program of the David Horowitz Freedom Center, and the author of The Politically Incorrect Guide to Islam (and the Crusades) (Regnery, 2005) and The Truth About Muhammad (Regnery, 2006). "The Covenant of the Islamic Resistance Movement (Hamas)," Aug. 18, 1988. See, for example, Abdul Hadi Palazzi, "What the Qur'an Really Says," Viewpoint, Winter 1998; Jamie Glazov, "The Koran and the Jews," interview with Khaleel Mohammed, FrontPageMagazine.com, June 3, 2004. Simon Rocker, "What the Koran Says about the Land of Israel," The Jewish Chronicle, Mar. 19, 2009. All translations of the Qur'an from A.J. Arberry, ed., The Koran (London: Allen and Unwin, 1955, subsequently Oxford University Press). Rocker, "What the Koran Says about the Land of Israel." Ibn Kathir, Tafsir Ibn Kathir (abridged), vol. 3 (London: Darussalam, 2000), pp. 142-3. Andrew Bostom, The Legacy of Islamic Antisemitism (Amherst, N.Y.: Prometheus, 2008), p. 35. Muhammed Ibn Ismaiel al-Bukhari, Sahih al-Bukhari: The Translation of the Meanings, vol. 4, book 56, Muhammad M. Khan, trans. (Houston: Darussalam, 1997), no. 2925. John Esposito, "Practice and Theory: A Response to 'Islam and the Challenge of Democracy,'" Boston Review, Apr./May 2003; "Al-Qaradawi full transcript," BBC News, July 8, 2004. Qur'an 3:75; 5:64; 3:181; 5:41; 5:13; 2:109; 3:120; 2:61; 2:74; 2:100; 59:13-4; 2:96; 2:79. Middle East Media Research Institute (MEMRI), Special Dispatch, no. 691, Apr. 6, 2004. MEMRI, Special Report, no. 11, Nov. 1, 2002. Related Topics: Islam, Israel & Zionism, Jews and Judaism | Robert Spencer | Fall 2009 MEQ receive the latest by email: subscribe to the free mef mailing list This text may be reposted or forwarded so long as it is presented as an integral whole with complete and accurate information provided about its author, date, place of publication, and original URL.